Hasselback potatoes present beautifully for any occassion. They are soft and creamy on the inside and crispy on the outside. Serve plain or with a dollop of sour cream. Preheat your oven 425°F. Scrub the potatoes with a soft brush and wash well. Do not peel. Using a large serving serving spoon, place a potato in the spoon. Slice through the potato and cut down to the lip of the spoon. The spoon will stop you from slicing all the way through. Once you have sliced all of the potatoes, place them cut sides up in a shallow baking dish. Drizzle the olive oil over the potatoes, ensuring they are well coated. Sprinkle on the minced garlic, salt and pepper. Place in the preheated oven uncovered and bake for 45 minutes. 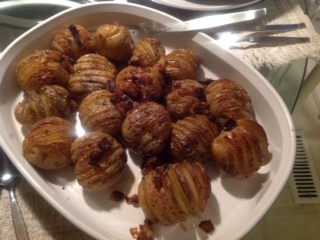 The outside of the potatoes will be golden brown and the inside soft and creamy. This entry was posted on March 30, 2015, in Food, Holidays and Celebrations, Ukrainian recipes and tagged Best Ukrainian recipes. Spring Tulips in Vancouver ! 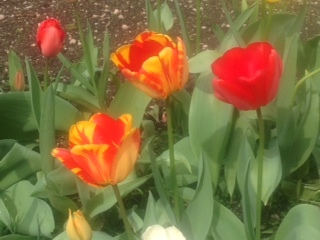 This entry was posted on March 30, 2015, in Uncategorized and tagged 2015, Spring time recipes, tulips, vancouver. It’s the time of year for me to once again commandeer the kitchen table and spread out my pysanky decorating materials. 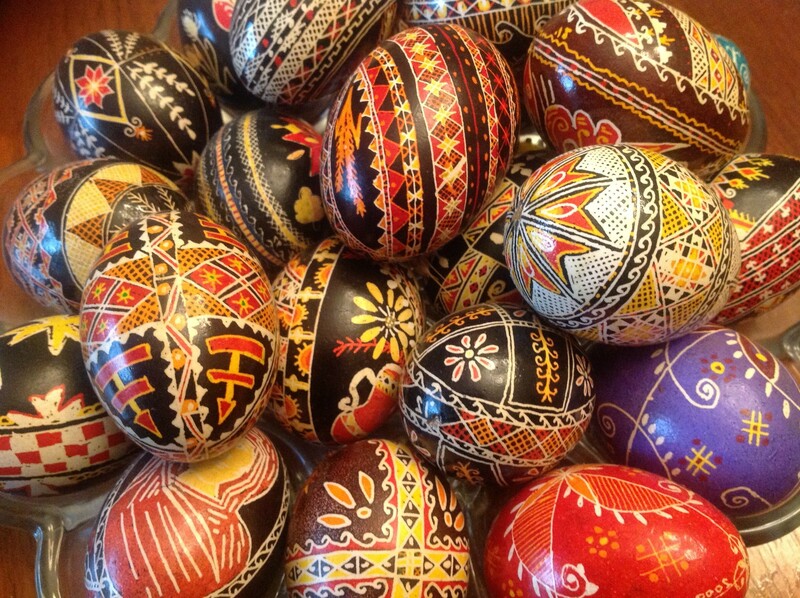 It’s a family tradition and all of us in our family enjoy decorating the pysanky. I started decorating Easter eggs when I was only around two years old. I remember looking forward to when Mom would get out the kistkas, the beeswax and the colourful dyes. We would collect the freshest eggs from the henhouse and then give them a gentle vinegar wash. Even if our lines were crooked and our colours smudged into one another, my brother, sister and I got to add our egg to the family Easter basket. 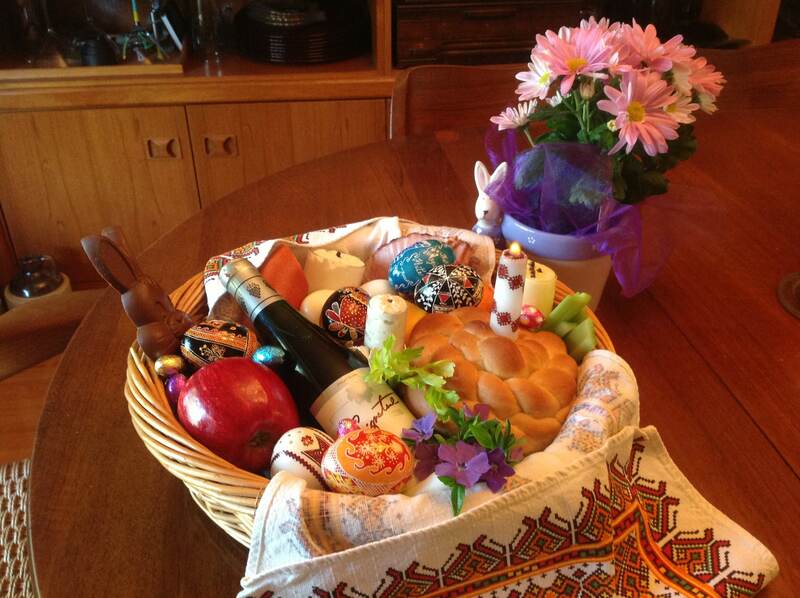 On Easter Sunday, the pysanky were blessed and exchanged with our extended family and friends. We always gave one as a gift to our priest as well. The decorating supplies have changed over the years but the technique is still the same. The supplies include raw, clean white eggs; a writing stylus (kistka); beeswax; pint jars containing various colours of dyes; vinegar, candles, drying racks and varnish. 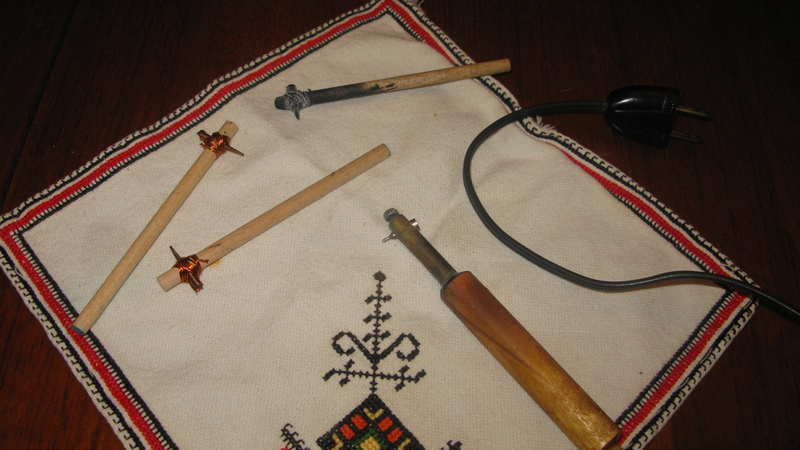 Mom used to make the kistkas out of a branch from a willow tree and the little round metal hook from an old calendar. She would roll the metal to form a funnel and then tie it to a small twig with a piece of fine wire from a grocery store twist tie. Not only can I still remember how those twig kistas felt in my hands, but I can still remember the smell of the wood. Today, kistkas are made of wood or plastic. 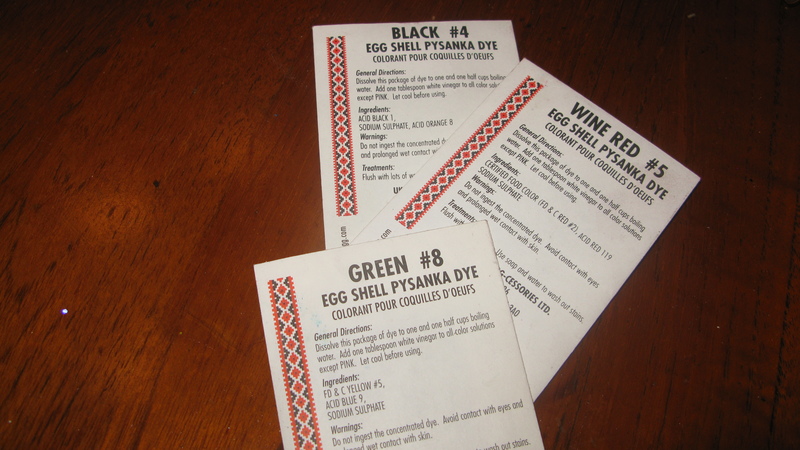 For a detailed explanation of the steps involved in decorating your own pysanka, please check out the Pages section called Pysanky at the top of my blog. 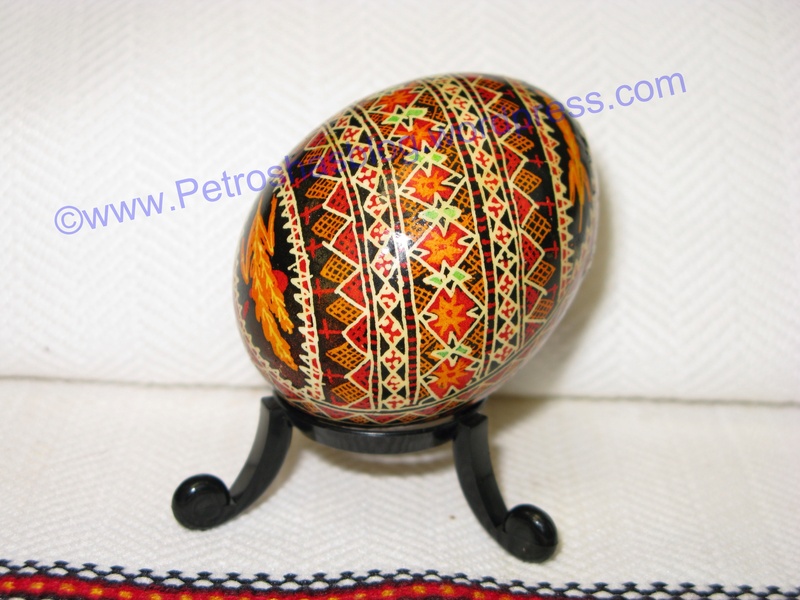 I have also included a slide show of various pysanky designs. 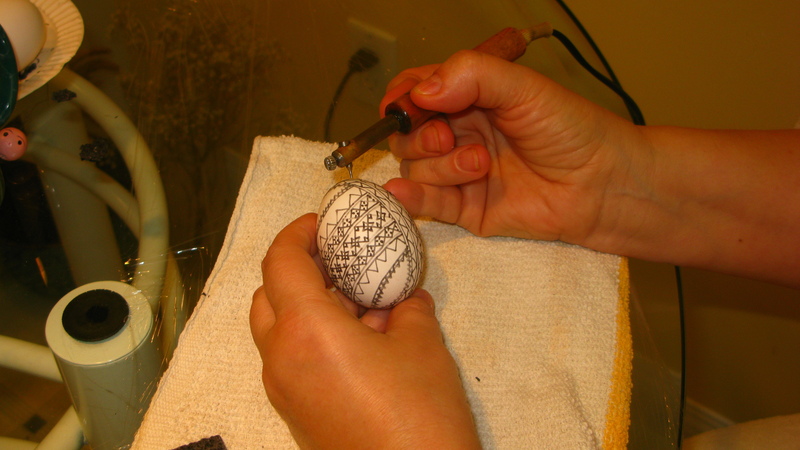 When you have created your own Pysanka, please consider sharing your photos with me. 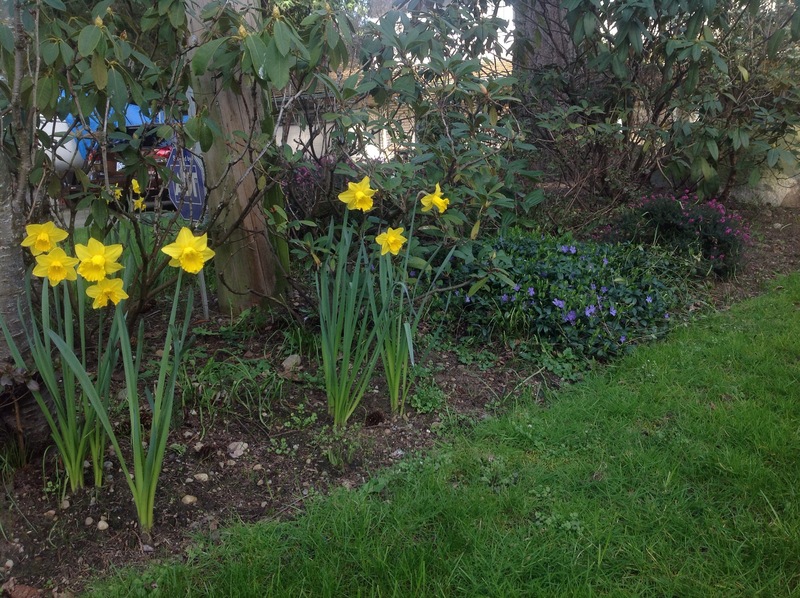 Our grass is green and the daffodils, crocuses and hyacinths are in bloom. The temperatures are in the mid-teens and higher. Ah, so this must be Spring! No, wait. How can it be Spring? It’s only March 3 and the Spring season does not begin until March 21st. Are we blessed or what? Okay so not everyone in Canada is cutting their grass yet or taking a walk in the sunshine wearing their Summertime shorts. Many of our fellow Canadians are still dealing with very cold temperatures into the minus 20s and shovelling out from several feet of snow. After all, it is only the beginning of March. Not sure why it’s happening but for us out here in the West Coast, we will take the sunshine and warm temperatures. I used the wheelbarrow yesterday to move some soil from part of my garden to the side yard. I then used the saw-horse to suspend some boards….wait, this is not what I want to tell you. I want to tell you that yesterday I got all choked up and cried when I used that saw-horse. Silly, right? A flood of memories about a saw-horse? Please read on. For those of you who do not know what a saw-horse is…here’s a picture of one in our backyard. Saw-horses are used in construction. It’s just a beam of wood with four legs. 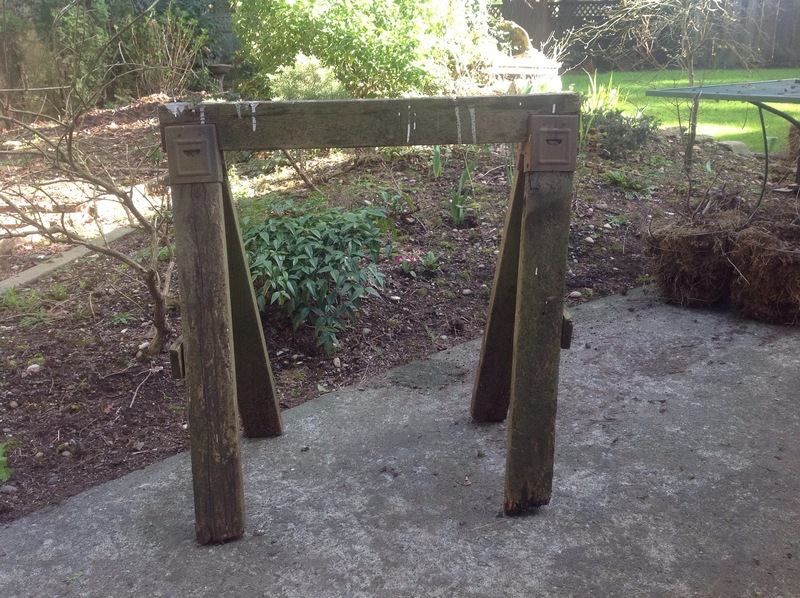 Two of these can be used to support a piece of wood for sawing, for example. Yesterday these saw-horses made me cry and are the catalysts reviving my memories of growing up in the cold Winter months in Manitoba. I recall one year in particular when I spent a lot of time playing outside with my dad. He was actually working but I thought of it as “playing with me”. My dad was a carpenter by trade. He was what was known as a finishing carpenter but from what I can remember, he worked on all sorts of projects. Playing with dad happened mostly in the Winter months because my dad was often laid off during this time of year. It was usually too cold for my dad to work outside on newly constructed houses. I found out years later that the construction crews always tried to at least get the framing done and the roof on so that they could have some work inside during the Winter months. But this did not always happen. So during these times, my dad worked at home. He kept busy with home maintenance projects that mom often found for him aka honey do lists. He really liked to build his own tool boxes and make small tables, chairs and dressers. He used many tools and he had saw-horses. I used to climb up on his saw-horses and pretend that they were my ponies. They seemed just perfect for sitting on whenever I was in the barn or wood shed with him. Remember now, there wasn’t a lot of things for a little kid to do in the middle of Winter on the prairies. I had to use my imagination and find my own fun. My dad knew that I really loved sitting on his saw-horses. He had to constantly shoo me off whenever he needed to use them. One bitterly cold day my dad said that he had a surprise for me outside. I bundled up very warm in my parka, fleece-lined boots, woollen scarf and mittens and followed him outside to the barn. Can you guess what was waiting for me in the barn? There was a horse of my very own. Dad had cut out a piece of plywood in the shape of a horse head and nailed it on a saw-horse. He had made a harness and reins out of twine. The saw-horse “pony” even had a tail made out of dry straw. It was a wonderful surprise for me. I hadn’t thought of that saw-horse until yesterday. Maybe this post isn’t about the memories of a wooden saw-horse “pony” at all….just memories of spending special times with my dad.